This may look like a paper plate full of dirt mixed with glue and various noodles but do not be mislead. It's actually a paleontological dig specimen filled with dinosaur fossils. I have been told that I am to keep it on our buffet for my "entire life." Done. I think the dirt might outlast the um....fossils. Oh Lisa..our boys are so different! If I know Dash, he's already buried his in the front yard, dissolved it in the toilet bowl, or chucked it into the toybox! Are you sure it doesn't belong in a museum? I think worms would really like it. They adore dinosaur bones you know. Well, how long could you possibly live anyway? I don't think it's that much to ask. I was worried after seeing the picture that you were going to ask us if we had any home remedies for intestinal parasites. And really now, what could be worse than *that* on your buffet table for life? 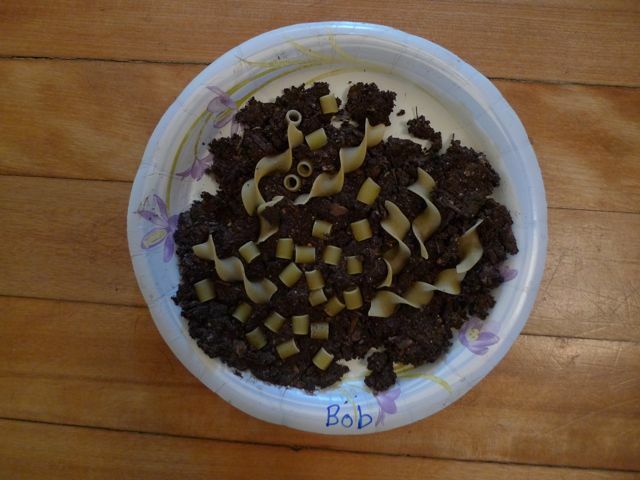 And that bowl is labeled "Bob" to distinguish it from the others bowls of dirt, glue and noodles crowding the buffet?